One of the least accurate words coined during the twentieth century is "totalitarian," used in common language to describe a government that kills and abuses its citizens. Whenever I read about Nazi or Soviet or Maoist or colonial oppression, the impression I get isn't of an all-seeing, all-knowing mind that superintends every aspect of a society, as the word totalitarian implies. The process is, on the contrary, very chaotic, with minor bureaucrats taking initiative and striking deals, writing dry and detailed memos, bickering during meetings, outsourcing their work to the locals, and complaining about how slow and jumbled everything is, joking how so no one really knows what's going on, ha, ha. Meanwhile, when off the clock, the people involved both as victims and perpetrators make art, fall in and out of love, get drunk, sing along to corny pop songs, slap each other, sweep the floor of their kitchens, try to achieve status in the eyes of their peers, and stare at the wall. Chaos and boredom at work; chaos and boredom at home. That may sound disconcertingly familiar. After reading books like Friedrich Reck's Diary of a Man in Despair or Jung Chang's Wild Swans, I have to conclude that the differences between "totalitarian" societies and the capitalistic West start to look more like differences of degree than of kind. Just as there's really no such thing as an "atom" (originally conceived as an indivisible elementary particle and now repurposed as one level of many as scientists descend into the cloudy weirdness of matter), there is no such thing as a totalitarian society as originally conceived. It follows from this that the methods necessary to resist a malign government, or a malign business, or a malign religion, or a malign family, or any other legitimized mob, must be as patient and tortuous and shrewd as the "totalitarian" thing bearing down on you. In all politics, no one struggles against a supernatural demon but against ordinary people with common motives; an extension of this is that common motives comprise more than we expect, or hope. So you've never collected anything at all? In that case you'll find it hard to understand why I write with such enthusiasm about things which may not strike you as deserving the slightest interest. For if anyone can truly be called a fanatic in the world, it is not the fisherman who can sit outdoors for ten hours on end in an icy January, or the hunter who doesn't mind crawling about in the marshes for whole days -- no, the collector beats both of them. Ahab has his whale and Don Quixote has his chivalry -- Soloukhin has icons. Many of these icons were systematically destroyed by agents of the government, confirming the common image of totalitarianism. But, in a country where icons were as common as potsherds in Greece, this direct method was hardly always necessary, and most icons were destroyed by neglect or by being locked up in disused churches. Out of necessity or ignorance or spite, the collectivized farmers would turn the icons into, for example, horse troughs. A village woman once told Soloukhin, "There might be times when you'd be feeding a horse and you'd bend over the trough, and get the fright of your life to see the face of Christ or the Virgin looking up at you. Such stern faces and big eyes -- it made your heart stop beating." To head off this destruction, the icons might be taken from a church and given to an old villager who had some special attachment to it. Confirming the testimony of Reck and Chang, the pattern under "totalitarianism" is rarely grand oppression and grand acts of rebellion. The picture painted by Soloukhin is of disorganized suppression of churches and disorganized salvaging of icons. In order to understand how strange it was for Soloukhin to become interested in collecting icons sometime in his late thirties, it's necessary to understand something about his background. Unlike most of the famous Russian writers of the nineteenth century, Soloukhin came from true peasant stock and had his roots in the Golden Ring region near Moscow, a patch of earth full of more churches than any place I've visited except maybe Italy. His birthdate, 1924, reads like a curse if you know the history of that region. Surviving collectivization and the Great Patriotic War, he eventually emerged as one of the state-sanctioned writers of the '50s. A peasant intellectual in an officially Marxist state, with the sanction and salary to write, a striver who had (to his later great shame) advanced his early career by criticizing Pasternak, a thoroughly modern Soviet who had spent childhood afternoons playing with and burning old icons -- there was nothing about this man to suggest that he would soon turn cultural traitor. The title of the book, Black Boards, refers to how the outermost varnish on old icons turns black after about a century. Being numerous and ubiquitous, the icons, once blackened, were used by rural Russians to board up windows or throw together potato crates. This would be just another Ozymandias moment, the pulped and hacked ruins of a dead civilization, except for one odd fact about the varnish: it's possible, through a precise though simple chemical treatment, to completely restore the blackened icon to its original color. Not only that, but most icons are several centuries old and the most recent painting -- say, from the nineteenth century -- almost always conceals an older and often better one -- say, from the sixteenth century. It's possible to chemically resurrect these older versions as well. Like almost everyone, Soloukhin was originally suspicious that any of this was possible, until his friend provided a demonstration, and Soloukhin was infected with the desire to collect icons, rambling through the countryside acquisitively like Chichikov in Gogol's Dead Souls. The image of the icon turning from potato crate to black board to brilliant color before revealing the deeper brilliance of more distant centuries is so potent, so tempting as a metaphor for art and memory, that it's a wonder Soloukhin didn't produce a solemn lyrical essay on icon collecting and restoration. Fortunately, what he wrote was much better and funnier. His narrative is essentially comic and involves his haggling with the stubborn old grandparents of Russia who have stowed "black boards" in their huts. In reply to my timid, ingratiating words of greeting she snapped: "Well, what is it? What do you want here? Be off with you!" "Listen, Aunt Dunya, please sit down and don't get so excited. Listen to me and I'll explain what it's all about." "It's no use telling me -- I'm a simple woman, I don't understand things, you're wasting your breath." However, she sat down on the bench; her hands with the earth drying on them rested on her knees, palms upward. For the next hour and a half, during which I exhausted all my eloquence and powers of conviction, ranging from sincere arguments to demagogic ones that should have been no less effective, Aunt Dunya kept repeating: "I've told you already, I don't understand things like that. But I won't change my mind about icons. The idea of my letting you take one out of the house -- how do I know who'd get hold of it? You'd only make fun of it, anyway, you and your friends." Aunt Dunya continued to rebuff him while claiming not to understand -- not government or iconography -- but things, a hilarious personal assessment that more darkly reflects what subterfuge was required to survive the preceding violent decades. Another episode involves trying to locate an old man who is alternatingly either too hungover or too drunk to produce his black board. When the government slates a church for destruction, agents fasten its doors with a fat modern lock, which they correctly assume none of the villagers can pick. The folks in village respond by fastening the door with a second lock of older make. Now, although the people have no access, neither does the government. As Soloukhin notes, it's precisely because the village lock is of an outdated design that the party agents are trapped outdoors. Soloukhin meets an old nun living in what amounts to a grotto hacked in the wall of a shutdown convent and eating, in her own words, no more than a sparrow, just a few bites brought to her by neighbors in the town. Nearly blind and deaf, she lives out her days guarding a few icons. These more melancholy notes pierce through the comedy now and then. There is a tension throughout the narrative between icons conceived as art and icons conceived as part of religion. In this writing, Soloukhin is careful to emphasize the former over the latter. Partly this is due to Soloukhin's living under a government hostile to religion, and that is certainly important. Look at the lengths Tartakovsky went to conceal the religious themes in his movies. But I think there is another way of looking at this divide, which goes beyond the question of whether you're Eastern Orthodox or Christian or a theist or spiritual or none of these. The divide is essentially between those who think art needs to be embedded into the practice of life and those who think it can be taken from that context and experienced just as well. (This relates to religion if you think of religion not as a set of truth-claims, to use the phrase that Analytic philosophers are addicted to, but as a set of repeated symbolic actions.) Let me explain further. The painters of the icons did not expect for their work to become world famous, to say nothing of their personal reputations. They expected the icon to be "used" by a specific congregation before, after a few hundred years, being painted over again. A comparison might be drawn to writing a novel for a circle of friends and circulating it among them but making no effort to publish it. Imagine, for that matter, painting a horse on the wall of a cave that only your tribe visits. This is a very different relationship to art from what could be termed the romantic model in which the artist toils in obscurity for many years before dying in an asylum and leaving a heap of masterpieces for the auctioneers to babble about for centuries. Soloukhin, as the art collector, wants to preserve the icons for posterity, whereas the old peasant wants to preserve the icon because it's what her ancestors kneeled in front of for generations. I would guess that Soloukhin takes the same view of this divide as I do: namely, as much as I admire the "embedded" relationship to art and feel that I should prefer it if only in solidarity with the selfless dedication of its adherents, that in my heart I'm really on the side of the art collector. Art can and should be taken out of its original context; in fact, goes this thinking, that's a petty good definition of art, that which can be appreciated outside of its original context. It may enhance my enjoyment of Hamlet to know that millions of others before me have, and millions of others after me will, also enjoy it; on the other hand, if everyone stopped reading it, it wouldn't diminish the enjoyment I feel reading it. 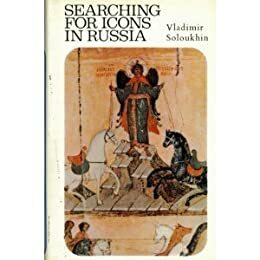 Soloukhin noted at one point that in previous centuries only very few knew that icons concealed older versions going back to the eleventh and twelfth century and that this secret was probably discovered only by accident. This recalls one of T.S. Eliot's jiu-jitsu aphorisms: "Some one said: 'The dead writers are remote from us because we know so much more than they did.' Precisely, and they are that which we know." To be able to see the entire range of talent going back centuries is what makes it exciting to live in a time when art is much more than what your tribe makes and holds. Still, there's something unsatisfying about this answer; if I had more space and time, I would want to analyze my ambivalence. Black Boards is a wonderful book that offers insight into how "totalitarian" societies actually work and how ordinary people offer resistance; Soloukhin was a great comic talent who conveyed his moral purpose subtlety and therefore all the more powerfully.